We'll travel through four New England States throughout this exciting and vibrant fall foliage tour which showcases a unique area in the United States each fall. Your days will be filled with unique excursions by trains and scenic cruises, as well as excellent regional sightseeing. There are so many great opportunities included in this full itinerary so don't miss out! This morning we meet our new travelling family as we depart our hometowns with a day of travel heading to New England states. Our "home away from home" tonight will be near Danbury, Connecticut with a leisure evening and dinner on your own. Get rested up tnight to be ready for the next few days which are completely filled with many activities. Breakfast included. This morning we board a true steam train with vintage rail cars on the Essex Steam Train departing from the historic Essex Station and travelling through the beautiful countryside along the Connecticut River Valley. This afternoon we will have time to wander along the brick pathways in Olde Mistick Village with many shops selling exceptional items from all over the world. Enjoy lunch on your own here. 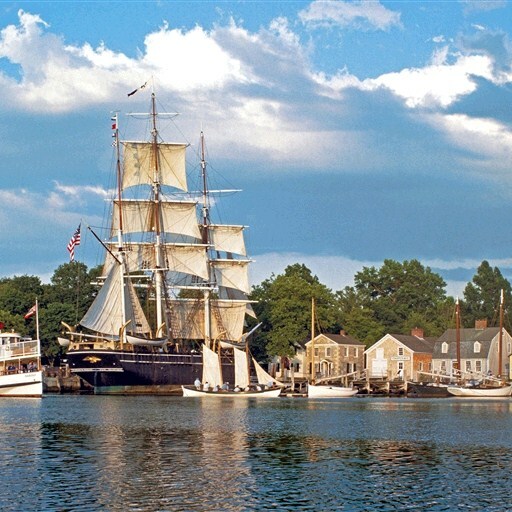 Our next stop today will be theworld-renowned Mystic Seaport to experience the lifestyle of the "Age of Sail". This unique maritime museum features a true seaport village, exhibit halls and historical interpreters which offers a wonderful link to our seafaring past. Visit the cooperage, learn about ship building, board a New England Tall Ship, discover the dangers and adventures of Whaling aboard the 19th century whaleship, the Charles W. Morgan...and so much more! We will then arrive at our hotel in Mystic, CT for tonight and dinner is included this evening. Breakfast included. This morning we meet our local guide for a Boston City Tour as we see all the highlights of this great city including the USS Constitution (the oldest warship in the US Navy), Beason Hill, the Freedom Trail, Boston Commons, Bunker Hill, Boston Public Garden, State House, Rose Kennedy Greenway, historic Faneuil Hall and Quincy Market - so much to see in Boston! Enjoy lunch on your own before we board our narrated Boston Harbor Cruise. Aboard this relaxing narrated cruise on historic Boston Harbor, yu will learn about the past, present and future of this historic waterfront area including Charles Navy Yard, Boston's fishing industry, Tea Party site and lots more. This evening we check in to our hotel for the next three nights at Dover, New Hampshsire and have an included dinner at a local restaurant. Breakfast included. Today, we will discover New Hampshire's largest lake by rail! 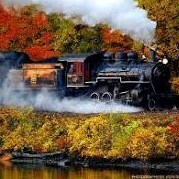 We'll board the Winnipesaukee Scenic Railroad for a scenic train excursion hugging the picturesque shoreline, surrounded by mountaintop outcrops with views of "Grand Style Resorts", pristine woodlands, lake wild life and much more. We will ride the rails of the historic tracks of the Boston and Maine Railroad right to our lunch cruise aboard the M/S Mount Washington boat. We'll then cruise the waters on Lake Winnipesaukee, an Indian term meaning "Beautiful Water in a high place". 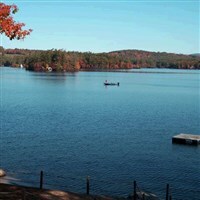 Relax and enjoy this 72-square mile lake, the largest in New Hampshire surrounded by three mountain ranges and 365 islands - wow! Scenery will be all around you so don't miss the spectacular views throughout - it's awesome! A delicious lunch buffet is included while you cruise. This afternoon we will have some free time to explore the charming lakeside village in Wolfeboro before visiting the popular Salmon Falls Stoneware. Housed in the historic Park Street Engine House, you will see crafters throwing these unique stoneware pots, each individually made and hand-decorated. We'll arrive back at our hotel this evening and dinner is on your own after a full day of New England touring. Breakfast included. 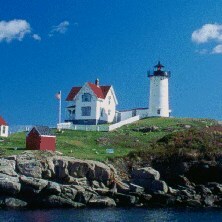 This morning we depart our hotel for Maine's rugged, rocky coast and picturesque lighthouses. The scene unfolds on the popular Lighthouse Cruise as you cruise from Portland's picturesque harbor seeing the Calendar Islands, coastal forts, Maine lobster boats, playful seals and an array of seabirds. 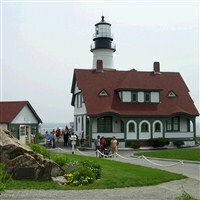 You may view as many as six lighthouses including an up-close experience at Maine's oldest and historic lighthouse called "Portland Headlight". Proudly perched on one of Maine's famous rocky outcrops overlooking this beautiful harbor, it is one of the most photographed lighthouses in New England. We will have some free time for lunch on your own at Old Port in Portland in this city's charming waterfornt distric filled with shops and eateries. We will take a trip back in time aboard the Maine Narrow Gauge Railraod and enjoy magnificent views of Portland's waterfront aboard antique rail cars pulled by hard-working steam and diesel locomotives. Discover the unique two-foot gauge tains that linked rural Maine to the rest of the world. Next, we will experience Portland's proud brewing at the Shipyard Brewery, brewing fine English style ailes. Hear the history and enjoy a tasting along with their gift shop as you wish. There will be a scenic photo stop at the Nubble Light. Maine's most photographed lighthouse before our included Maine Lobsterbake dinner coupled with a dose of down east entertainment...so much fun! Breakfast included. Another rail excursion is waiting for us today as we board AMtrak's Downeaster Train for a coastal ride from New Hampshire to Massachusetts with incredible views. Sit back, relax and enjoy the ride as you take in the beauty of coastal New England in comfort. Lunch will be on your own in Connecticut's capital city of Hartford on the way to our last overnight hotel in Pennsylvanai. Dinner is included tonight. Breakfast included. This morning we continue our journey towards home with comfort stops and meal stops en route after a top-notch New England tour! Includes: Deluxe motorcoach transportation, 6 night's accommodations, 6 breakfasts, 4 dinner (including 1 Maine Lobster dinner), 1 luncheon cruise, all tour listed in itinerary.